This irresistible combination of chocolate and pumpkin is too good to pass up. After the first bite of this silky pumpkin pie, you'll be hooked. 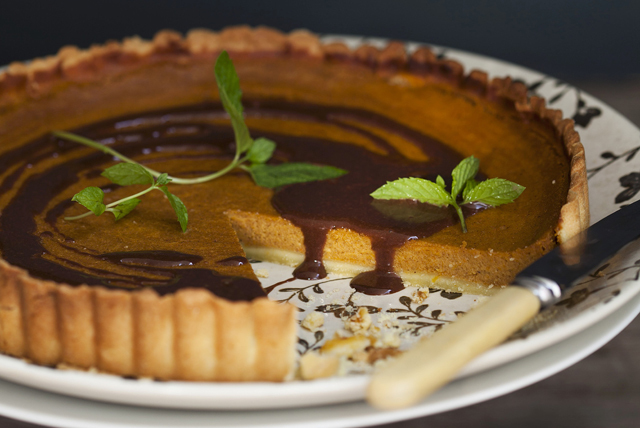 And the drizzle of chocolate syrup adds the perfect finishing touch to this traditional pumpkin pie. Use pulsing action to process flour, cream cheese and butter in food processer until mixture is well blended and pulls away from side of container. Shape dough into ball; flatten slightly. Wrap tightly with plastic wrap. Refrigerate 1 hour. Heat oven to 425ºF. Mix all remaining ingredients except chocolate syrup in large bowl until blended. Roll out dough to 13-inch round on lightly floured surface. Use to line 9-inch tart pan with removable bottom; trim edge of pastry. Fill crust with pumpkin mixture. Bake 40 to 45 min. or until knife inserted in centre comes out clean, reducing oven temperature to 350ºF after 15 min. Cool completely. Run knife around pie to loosen from rim of pan; remove rim. Drizzle chocolate syrup over pie just before serving. Gather pastry trimming pastry into ball, then roll out and cut into desired shapes with small cookie cutters. Use moistened pastry brush to "glue" cutouts to edge of crust before baking as directed. If you find the crust is browning too quickly, cover the pie loosely with foil to help prevent it from becoming too brown. Substitute a 9-inch pie plate for the tart pan.